Print on a wide range of latex media including vinyl, textile, film, paper and un-coated papers. 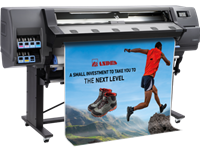 HP Latex Printers produce vivid indoor and outdoor signage, retail point of purchase displays, vehicle graphics and interior decoration. Signage is more durable and long lasting than eco-solvent materials. Enjoy shorter time to delivery with prints are dry and ready for finishing immediately after printing with rapid dry HP Latex Ink technology. Proactive printer alerts and accurate cost reporting to minimize interruptions provide price quotes. HP Latex Printers are environmentally friendly. Return and recycle your latex supplies and improve ink efficiency.